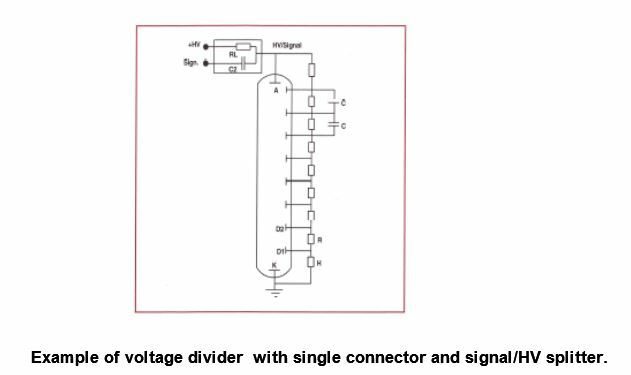 Scintillation detectors usually employ a Voltage Divider (VD) network to operate the photomultiplier tube This sometimes called “bleeder network” defines a potential (voltage) difference between the cathode, dynodes and anode of the PMT. The exact design of this network is of influence for proper working of the scintillation detector. Some details of voltage divider networks are discussed below. The descriptions below are not exhaustive; for more details we refer to the photomultiplier manufacturer’s literature. Positive or Negative High Voltage? Positive or Negative High Voltage ? It is possible to operate a photomultiplier tube with either A. anode at positive potential (cathode at ground) or B. anode at ground (cathode at positive potential). For measurements of DC anode current such as in some X-ray applications, option B is the only choice since in the first option the anode must be separated from the follow-up electronics by means of a high voltage capacitor. On the other hand, option A is used for most standard applications since the μ-metal shield should be preferably at cathode potential. Option A implies that cathode, detector mass (ground) and shield are all connected together. In option B, the shield must be very well insulated from the detector mass and special construction requirements apply. In all cases, a detector designed for POSITIVE high voltage operation, should NEVER be connected to a Plug-in Voltage divider wired for negative High Voltage since this will cause a dangerous situation with the detector housing at live potential ! All standard SCIONIX detectors with photomultiplier readout are designed for POSITIVE high voltage. A detector designed for NEGATIVE High Voltage has the suffix -NEG at the end of the type number. 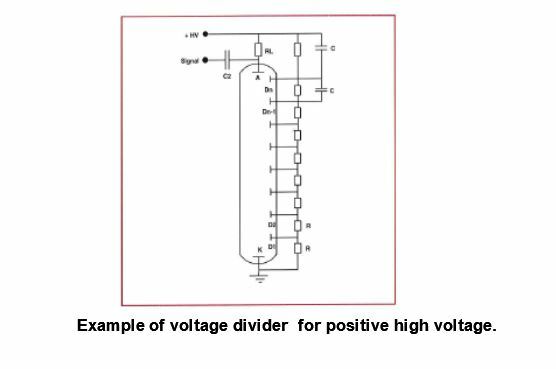 Negative high voltage is preferred for fast timing applications where the possibility of discharges between the cathode of the PMT and the μ-shield are to be avoided. Voltage dividers for Detectors operated at positive high voltage can be wired with a single connector for signal and HV. At the electronic’s side, these can be separated using a simple splitter, as illustrated below. The design of the voltage divider influences the performance of a detector. At high count rates, the voltage across dynodes may drop and the average bleeder current should be always defined as at least 10 times larger than the average anode current in the detector. A standard resistor value between dynodes is 470 kΩ which is a compromise between bleeder current and gain stability which is sufficient for count rates up to approx. 50.000 c/s. Voltage dividers may be linear (most common), tapered or specially stabilized with Zener dynodes or transistors. The number of possibilities is large. A very important aspect is the potential (electric field) between the cathode and the first dynode of the PMT. In any case, this potential should be sufficient to ensure a good photoelectron collection efficiency. Usually, this voltage is defined by the PMT manufacturer. The gain of a scintillation detector varies with each PMT and is also strongly influenced by the exact design of the voltage divider. If the absolute detector gain is of importance, it can be defined as: the output voltage (in e.g. 1 MΩ) at a specific operating voltage of the PMT for a certain energy absorbed in the detector. 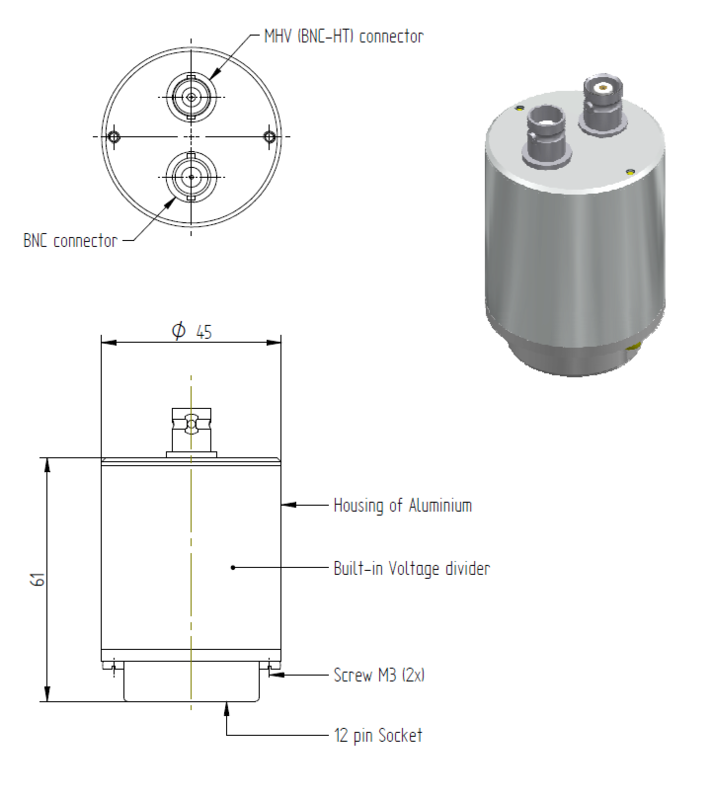 PMTs can be selected on gain but adjustment of the gain of the detector by varying the voltage in the VD by means of a precision potentiometer is much more convenient. Extra options on voltage dividers are e.g. a gain potentiometer, an extra dynode output or a focus potentiometer. 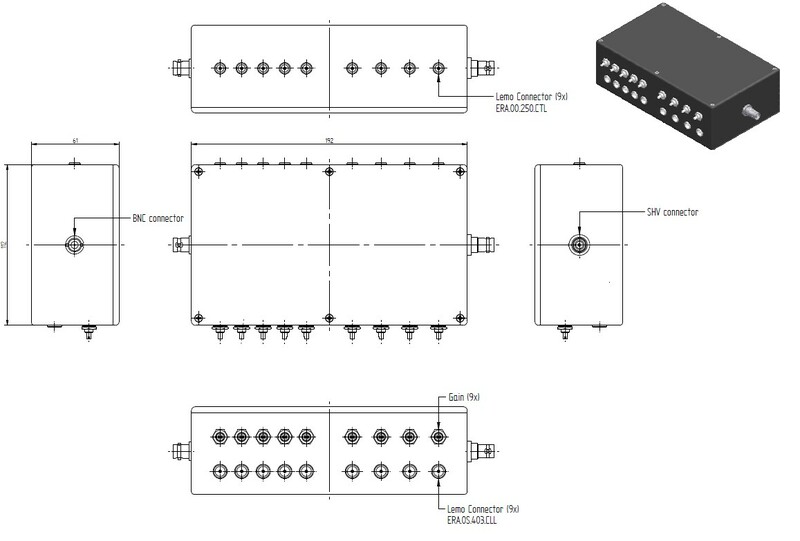 When asked for advice, SCIONIX can design the voltage divider best suited for your application without any additional cost. Voltage Dividers and other electronics can be incorporated into the scintillation detector. 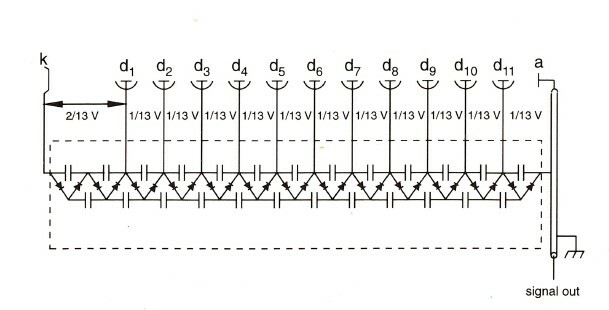 In this case, the resistor network is directly soldered onto the pins of the PMT which implies a minimal length of the assembly. Also for low background applications this is the preferable option. The connector(s) for high voltage and signal are located at the back of the assembly. Also flying leads is an option. When it is expected that detectors have to be interchanged often it may be preferable to use a so-called “plug-on” option in which case the voltage divider and associated electronics are mounted in a small base with the same diameter as the detector which is plugged on the pins of the socket of the PMT. Most frequently used PMT sockets in this respect are the 12 pins JEDEC B12-43 base for 38 mm diameter PMTs and the 14 pins JEDEC B14-38 base for 51, 76 and 127 mm diameter PMTs. These are also the standard sockets for scintillation detectors supplied without voltage divider. Below some examples are presented. Standard plug-on voltage divider for 14 pins PMT sockets, VD 14 – E1. Standard plug-on Voltage divider for 12 pins PMT sockets, VD 12 – E1. A detector signal will be attenuated in a long cable and when signals have to be transported over more say than 10 m of cable this effect cannot be neglected. Signals even may become deformed and signal differences between a set of detectors having different cable lengths can be a problem. Furthermore, the signal that is to fed into a main amplifier (also called shaping amplifier or spectroscopic amplifier) needs to have a certain pulse fall time (typically 50 μs) in order to allow proper pole-zero and base-line correction. This effect is especially important at high count rates. For digital signal processors the preferable pulse fall times are usually of the order of a microsecond. To solve the above problems, scintillation detectors can be supplied with a built-in (or plug-on) preamplifier /buffer amplifier. This amplifier has an output impedance of 50 Ω for proper matching to the most frequently used cable impedance (reflections). The standard SCIONIX voltage divider/ preamplifier the VD (12) 14 – E2 is an example of this suited for a wide variety of PMTs. This amplifier operates with a wide variety of voltages, is very fast (rise time < 50 ns) and can drive cable lengths of 100 m or more. Varieties for ultra low power consumption exist and the amplifier is very small so that it will fit in almost every scintillation detector. Please consult SCIONIX for your specific requirements regarding signal shape, power consumption etc. 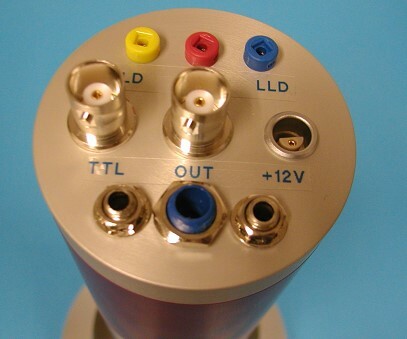 Often, high voltage, signal and preamplifier power are fed in via separate connectors The SCIONIX standard connector for high voltage is the SHV (Super High Voltage) connector, the most frequently used standard in nuclear electronics. 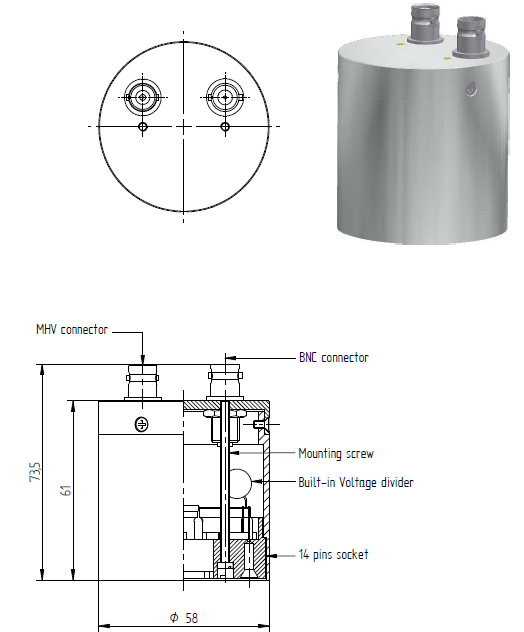 For signals, BNC connectors are the standard and for preamplifier power signals, the dual LEMO type 0S and the 9 pins sub-D connector are normally used. Many other possibilities exist such as flying leads options, water-tight connectors, MHV, TNC, PET-100 and different types of LEMO or FISHER connectors. 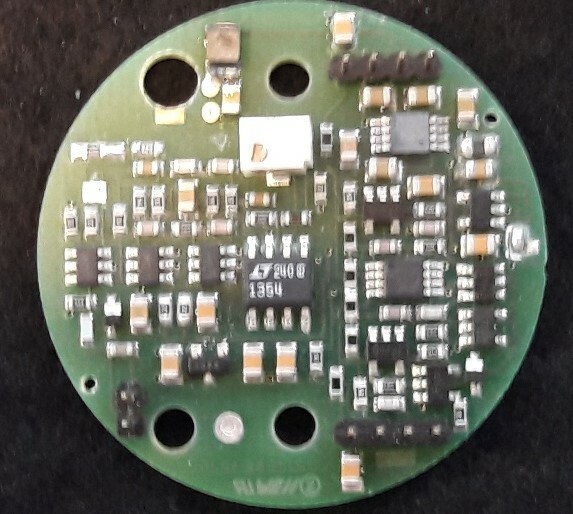 Recent developments in hybrid circuitry have allowed to incorporate a number of other electronic components into the scintillation detector assembly which eliminates in some applications the necessity of NIM based electronics. An example of the above is the scintillation detector with a built-in High Voltage Generator ( – HV option,). This can be a small Cockcroft – Walton (CW) generator which produces the high voltage required to operate a PMT. This unit only requires a DC voltage of + 5 V or + 12 V and requires only 100 mW of power. The unit is fully integrated with the PMT so there are no high voltage leads anywhere in the assembly. The gain of the PMT is maintained also at high anode currents (up to 100 μA) and the unit adds only 50 mm to the length of the PMT. 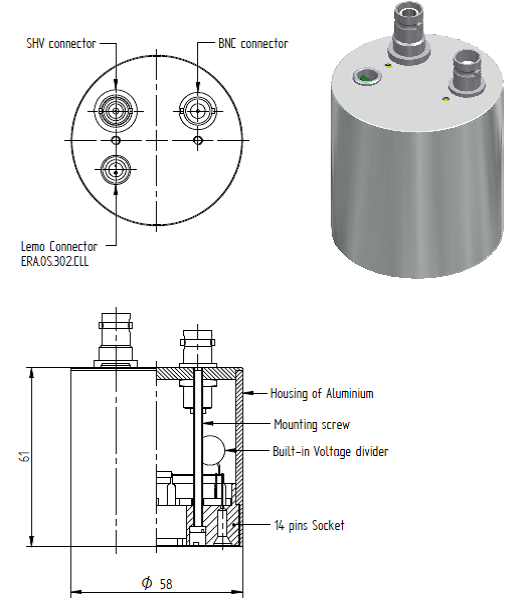 The high voltage can be factory set, precision potentiometer adjustable or set by a (0-5V) regulating voltage. Below the advantages are summarized. When there is not enough space available also conventional high voltage generators can be incorporated in a detector assembly in combination with a voltage divider chain. Besides the above mentioned preamplifiers it is also possible to incorporate e.g. shaping amplifiers (spectroscopic amplifiers) or Single Channel Analyzers (SCAs) into a detector assembly. All these components constructed as small SMD or hybrid circuits are very small in dimension. Specific parameters of these devices can be defined by the user Please consult SCIONIX for more details. Scintillation detectors with PIN photodiode readout or with SiPms can be equipped with built-in charge sensitive preamplifiers or built in bias generator / preamplifiers. For the effective operation of series of scintillation detectors with a single high voltage power supply SCIONIX offers junction boxes to sum signals and high voltage inputs. These modules can be equipped with built-in preamplifiers or high voltage modules.